Over the last twenty years, the EU has become a prominent crisis management actor. This chapter aims to locate the EU’s crisis management role in the UN mandate of “maintaining international peace and security”. What is the EU’s approach to managing crises? Does this approach converge with and support the UN peacekeeping agenda? What do EU member states’ institutional choices tell us about the UN–EU global–regional peace and security partnership? Tardy provides an overview of EU crisis management operations, compares EU and UN operations, and sheds light on the causes of this cooperation and its consequences for their relationship. Finally, the chapter assesses the European participation in Mali and suggests how EU member states’ institutional preferences may evolve in the coming years. The European Union entered the world of crisis management in 2003 when it launched its first police mission—in Bosnia and Herzegovina—and, a few months later, its first military operations—in Macedonia and then in the Democratic Republic of the Congo (DRC). This came after a five-year period of conceptualisation of what was then called the European Security and Defence Policy (ESDP), which aimed to give the EU an autonomous capacity in the broad area of crisis management. ESDP was partly an answer to the EU’s inability to respond meaningfully to the Yugoslav conflicts and to implement the ambitious goal of an EU Common Foreign Policy (defined in the 1992 Maastricht Treaty). Over the last fifteen years, more than 30 EU operations have reflected and shaped a certain “EU approach” to respond to crises that is in various manners distinct from other international organisations’ approaches. But the EU’s approach also features typical crisis management activities and is therefore in many ways similar to the United Nations’ crisis management style. In fact, analysing the EU crisis management policy cannot be done while ignoring parallel developments at the UN level or simply ignoring the UN as a reference point for evaluating/assessing the EU’s incremental engagement in crisis management. Indeed the very first EU operations in Bosnia and the DRC were sequential with (Bosnia) or in support of (DRC) UN operations, and, since then, most EU missions have in some ways cooperated with UN operations, most recently in Mali and in the Central African Republic (CAR). Furthermore, field cooperation was from the start accompanied by a parallel process of institutionalisation of the UN-EU relationship that has not been observed to the same extent between the UN and any other regional organisation. This being said, the EU and the UN sometimes diverge on policy, and may find themselves as competing crisis management actors. Differences in capacities (financial and military), structure (membership and mandate) and political culture can also create asymmetries and hamper full reciprocity between the two actors. In the field over the last twenty years, UN operations have also suffered from a quasi-absence of European states as troop contributors. EU member states significantly finance UN peacekeeping, and have operated a comeback to UN operations in Mali, yet they have largely preferred other institutional frameworks for their own crisis management activities. One of the four “essential shifts” identified by the 2015 High-Level Panel on Peace Operations is the need for a “stronger, more inclusive peace and security partnership” (UN 2015a, p. viii). Likewise, the Secretary-General’s report in response to the High-Level Panel makes “global-regional partnerships” one of three pillars of the UN action plan on strengthening peace operations (UN 2015b, paras. 28–32). In response, the 2016 EU Global Strategy for Foreign and Security Policy defines four categories of “vital interests” for the EU, the fourth one being a “rules-based global order with multilateralism as its key principle and the United Nations at its core” (European Union 2016, p. 15). 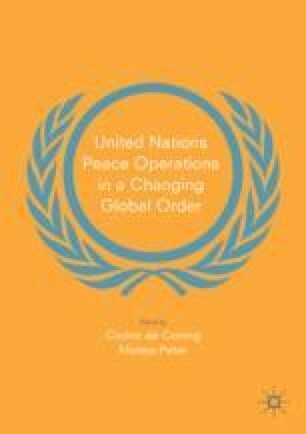 This chapter aims at locating the EU’s crisis management role in the broader framework of the UN’s general mandate of “maintaining international peace and security.” What is the EU’s approach to managing crises? To what extent does the EU converge with and support the UN peacekeeping agenda? How are EU member states’ own institutional choices being shaped and what do these choices tell us about the UN-EU relationship or, in other words, about the global-regional peace and security partnership? This chapter starts by providing an overview of EU crisis management operations, including their objectives and specific character. It then looks at how EU operations relate to the UN in legal, political, and operational terms, and presents similarities and differences between EU and UN operations. Third, the chapter sheds light on why the two institutions started cooperating and how this cooperation has shaped their relationship. Finally, the chapter looks at the issue of EU member states’ contribution to UN peacekeeping; it takes stock of the European participation in the UN mission in Mali as of 2014, and it assesses how EU member states’ institutional preferences may evolve in the coming years. The development of the EU crisis management policy came as a response to a need, expressed in the midst of the Kosovo conflict in the late 1990s and in the broader framework of the post-Cold War systemic evolutions, to provide the EU with the means to contribute to international security governance (Howorth 2007; Grevi et al. 2009; Biscop and Whitman 2012). In 1992, the Maastricht Treaty—that formally created the European Union and replaced the European Economic Community—had already laid the ground for a Common Foreign and Security Policy (CFSP). Yet the EU foreign policy stumbled over the Balkan conflicts in Croatia and then Bosnia and Herzegovina, while the US’ (and NATO’s) role in unblocking the situations both in Bosnia (in 1995) and Kosovo (in 1999) confirmed the limitations of the EU political and security ambitions. For European leaders—most prominently the French and the British—the EU was to be given a “capacity for autonomous action, backed up by credible military forces, the means to decide to use them and a readiness to do so, in order to respond to international crises” (Joint Declaration on European Defence 1998, art. 2). This commitment led to the design of a ESDP . In essence, ESDP has developed as a policy to manage crises occurring outside the EU, and excluding any collective defence mandate which should remain the prerogative of NATO for European states that are members of the Alliance (European Union 2007, art. 42.7). In practice, ESDP pushed the deployments of military and civilian assets in the management of crises in the Balkans, in Sub-Saharan Africa, and to a lesser extent in the Middle East and Asia. ESDP was then renamed Common Security and Defence Policy (CSDP) by the Lisbon Treaty (European Union 2007). In 2017, CSDP operations are the most visible activity of the EU in the international security domain, and have been the most tangible examples of the coming to age of CSDP as well as EU security “actorness” (Tardy 2015, p. 51). In EU parlance, CSDP military activities are called “operations” while civilian activities are called “missions.” By design, EU crisis management operations are either of a military or of a civilian nature. Although the Treaty on European Union (TEU) does not preclude the establishment of operations that could combine military and civilian elements, the EU planning and conduct structures, together with the relevant financial regulations, have so far prevented the creation of integrated military-civilian operations. Since 2003, the EU has launched and run 35 operations and missions, 23 of which were civilian and 12 military (Howorth 2014, Chapter 5; European Parliament 2012; Bund et al. 2017). In total, there are 16 on-going CSDP operations as of November 2017, ten civilian and six military. Civilian missions include the Kosovo rule of law mission (EULEX Kosovo), the monitoring mission in Georgia (EUMM Georgia), and capacity-building missions in Niger (EUCAP Sahel Niger), Mali (EUCAP Sahel Mali), Ukraine (EUAM Ukraine) and the Horn of Africa (EUCAP Nestor). Two of the military operations are maritime operations (Operation Atalanta off the coast of Somalia and Operation EUNAVFOR Med-Sophia in the south Mediterranean), and three are training missions (EU Training Missions in Somalia, Mali, and the Central African Republic) (Table 12.1). In the civilian domain, EU crisis management focuses on the rule of law, good governance, and security sector reform; it proceeds through capacity-building and advisory tasks, often in cooperation with other crisis management actors.1 Civilian missions fall within the three broad categories of strengthening missions, monitoring missions, and executive missions, although this latter category counts only one operation. Strengthening missions are mainly about capacity-building in the field of rule of law. They aim at assisting the recipient state in the reform and strengthening of its judicial and law enforcement institutions. This is done through monitoring, mentoring, and advising, as well as training and in some cases the provision of equipment. All civilian missions established since the entry into force of the Lisbon Treaty in 2009 are categorised as strengthening missions. Monitoring missions provide third-party observation of an activity or a process, be it the performance of a given sector (police, justice, border, etc.) or the implementation of an agreement (cease-fire line, peace agreement, etc.). The third category of civilian missions is that of executive missions, i.e. operations that can exert certain functions on behalf of the recipient state. The only example is EULEX Kosovo that has executive responsibilities in the areas of war crimes, organised crime and high-level corruption, as well as property and privatisation cases. In the military domain, CSDP operations fit into the definition of crisis management in the sense that they fall short of war-fighting or openly coercive operations.2 Maybe with the exception of the newly-created mission in the South Mediterranean Sea (EUNAVFOR Med-Sophia), EU operations are third-party interventions that are not supposed to take sides, or identify and militarily defeat an enemy. Some operations, like Atalanta, contain a coercive dimension to defeat pirates operating in the Gulf of Aden. Yet these operations do not have peace enforcement mandates, which makes them conceptually distinct from operations such as the NATO-led operation in Libya in 2011 or the French-led operation in Mali since 2013. The operation against migrants smugglers (Operation Sophia) is potentially different in the sense that it is the first EU operation that could theoretically lead to peace enforcement-type activities. The operation’s mandate provides for the possibility of resorting to force against “spoilers” in a way that had never been contemplated in previous CSDP military operations. More precisely, the authorisation to “take all necessary measures” against a vessel and related assets, including through “disposing of them or rendering them inoperable” (Council of the European Union 2015a, art. 2.2.c)—and this after a phase of intelligence gathering—implies that the operation can proactively chase the smugglers and possibly resort to force against them in cases other than self-defence. Yet its implementation is conditioned upon either the consent of the Libyan state or the blessing of the UN Security Council, none of which had been obtained as of November 2017. In any case, given EU member states’ general risk aversion, even the full implementation of EUNAVFOR Med’s mandate would not make the mission a peace enforcement operation similar to the ones deployed in the last decade by states or by NATO. Thirty-five CSDP operations attest to the existence of a certain EU conception of security policy that is distinct from any other institution’s conception. This refers to a specific EU security culture—defined in terms of shared ideas and beliefs in the security domain that would lead the organisation to act in a specific manner and of which CSDP operations and missions are an expression. This security culture reflects a certain way to handle crises, through a mix of civilian and military responses, a focus on rather short-term and consensual activities, almost always in support of existing state authorities, and in accordance with international legal instruments and a set of values and principles. CSDP is about projecting security outside of the EU area in order to contribute to the stabilisation of states or regions that may potentially be the source of further destabilisation or more directly threaten EU societies. Such a security culture has been developed by design as much as by default; it results both from the difficulty to embrace a broader spectrum and from the desire to act at a particular level and through EU-specific tools or methods. In this broad context, CSDP has over the last years evolved to more clearly respond to direct threats to European security, be it with operation Sophia and its migration-focused mandate or missions in the Sahel that also partly embrace an EU anti-terrorism or migration agenda. EU vs. UN Operations: How Similar? How Different? The EU has—more or less intentionally—developed its crisis management policy in reference to other international organisations, most notably NATO and the United Nations. The EU political-military structure (with the Political and Security Committee, the Military Committee, and the Military Staff) was copied from NATO’s, while the NATO operations in Bosnia (IFOR then SFOR) in the implementation of the Dayton Peace Agreement and the NATO operation in Kosovo (KFOR) following the spring 1999 air campaign provided templates of what the EU should be able to do in the security domain. Similarly, the UN was early on a source of inspiration and a point of reference for the EU’s ESDP. At the legal level, all EU documents explicitly refer to the necessity for the EU to act in accordance with the UN Charter. Moreover, CSDP operations are established on the basis of a combination of a decision of the Council of ministers of the EU and either an invitation by the host state or a UN Security Council (UNSC) resolution under Chapter VII of the UN Charter (that allows for some sort of coercion). In practice, all civilian missions (with the exception of EULEX Kosovo) have been established on the basis of an invitation of the recipient state. Military operations, for their part, fall into two categories. The first category includes those created with UNSC Resolutions referring to Chapter VII of the UN Charter. These include Althea in Bosnia, Atalanta in the Gulf of Aden, EUFOR RCA, as well as in the past the two operations in the DRC (2003 and 2006) or the one in Chad (2008–2009). The second category includes those created on the basis of an invitation, such as EUTMs in Mali, Somalia, and CAR. Quite a few of the military operations not created on the basis of a UNSC resolution, as well as some civilian missions, are nonetheless referred to in UNSC resolutions. Such reference provides a degree of legitimacy to the EU endeavours. It also helps in future coordination with other international and local actors as various EU entities can draw on the UNSC text to justify their presence. In all cases, the host government has consented to the EU deployment. In the field, EU and UN operations exhibit some similarities across levels. First, both EU and UN peace operations are consent-based and support rather than substitute local authorities. Although the EU’s approach towards the use of force can be more robust than the UN’s, both institutions are risk-averse and resent peace enforcement. Indeed, the three key principles of UN peacekeeping—impartiality, limited resort to force, and consent—by and large apply to EU-led operations. Interestingly, the EU and the UN are closer on the issue of the use of force than either organisation is to NATO or even the AU, which are both more comfortable with the idea of “enforcing peace” through military operations. The scope of activities is equally large in both institutions that embrace the whole conflict spectrum, encompassing prevention, peacekeeping, peacebuilding, and stabilisation. Within this framework, the type of activities carried out are conceptually close. Both institutions seek to bring stability to a given place by using similar tools, i.e. a mix of military and civilian instruments that aim at providing security, strengthening the rule of law and governance institutions, reforming the security sector, facilitating economic recovery, supporting mediation and reconciliation, promoting human rights, etc. In doing so, the EU and the UN follow the “liberal peace” agenda by which the overall objective of their presence is the establishment of sustainable peace that should result from the combination of a democratic system and a market economy. Finally, the UN and the EU are confronted with the same type of difficulties, ranging from a weak political support from their own member states to the difficulty to embed their operations in a broader political/strategic framework, the faltering consent of the host state and local actors, or the difficulty to operate and produce an impact in highly volatile environments (where there is no peace to keep) (Koops et al. 2015; UN 2014). The parallel UN and EU debates on the necessity to be “more strategic,” the effectiveness and impact of the operations, the imperative of “delivering as one” or acting through a “comprehensive/integrated approach,” and the insistence on local ownership and the critique of “imposing the liberal peace” all attest to similarities in the UN and EU’s respective agendas and associated challenges. In this context though, UN and EU operations also differ in certain ways. First, the UN global and universal mandate creates an expectation to respond to crises, an expectation that exists in no other regional organisation. The UN does not always intervene, but it certainly intervenes less selectively than the EU. More practically, UN peace operations are significantly larger than EU operations. As an example, the latest two UN operations in Mali and CAR have over 10,000 uniformed personnel, which is more than the total strength of the 16 EU operations. The largest EU operation to date, operation Althea in Bosnia and Herzegovina, counted 7000 troops at its deployment in 2004, which would represent a modest size for any UN peacekeeping operation. Also, most EU civilian missions count less than 200 personnel, which makes them comparable to UN political missions rather than to peacekeeping operations. Third, UN operations tend to be longer than EU operations, although recent trends indicate that EU operations’ duration is increasing. While a few EU operations have indeed lasted a decade or more, most operations last less than five years. In contrast, UN operations often exceed a decade, for both good (the long-term needs of the host countries) and bad (structural difficulties to terminate them) reasons. This difference also accounts for variations in the two institutions’ crisis management policies: a more crisis response-oriented for the EU vs. a longer-term structural approach for the UN. Fourth, the combination of size and length creates a difference in the level of ambition and expected impact. Although CSDP operations can be quite ambitious, because of their format and duration, they can hardly be expected to generate the kind of strategic impact that UN operations may produce or aspire to have (Tardy 2015, pp. 32–33). The type of political, economic, and social engineering that characterises quite a few of the multidimensional UN operations is seldom at play within EU operations. Fifth, the degree of political control is tighter over EU missions than over UN operations. Member states play a much more central role in the EU decision-making and planning processes than within the UN. This relates to the decision-making structure itself: while the UN Security Council is composed of a very limited number of states, and few with veto power, the EU Political and Security Committee comprises 28 members states with make decisions unanimously. In terms of planning, but also of command and control, the level of interference by or scrutiny of the political level is also more evident on the EU side. This implies a more politicised—and also more selective—EU approach, while UN operations can have a life on their own without much interference from the member states. Sixth, as mentioned earlier, UN operations are more integrated than EU missions. For various reasons, it is not possible for EU operations to be of a civil-military nature; hence the typology of military operations vs. civilian missions. Following the release in 2016 of the EU Global Strategy for Foreign and Security Policy, the concept of an “integrated approach to conflicts and crises” has been framed within the EU to replace that of a “comprehensive approach.” The EU “integrated approach” aims to further ensure the coherence and coordination of EU activities through a “multi-phased,” “multi-dimensional,” “multi-level,” and “multi-lateral approach” (European Union 2016, p. 18). However, the civil-military caesura is there to stay within the EU and the type of integration of the military and civilian components within UN operations will remain unmatched in the EU. Finally, the nature of troop contributors shapes the type of capabilities that are made available to the two organisations. Theoretically, UN operations could benefit from the military capabilities of European states if these states were contributing to UN operations. However, the quasi-absence of Europe—and as a matter of fact of most countries with high-tech military equipment—from UN operations deprives these operations from the equipment that EU or NATO operations benefit from. The EU and the UN: Natural Partners? In many ways, the relationship between the United Nations and the European Union has during the last decade developed into the most closed-knit institutionalised partnership between two independent organisations. From a UN perspective, the EU aspiration to become a fully-fledged crisis management actor was initially perceived with cautious optimism and mixed feelings. On the one hand, it was hoped that this new capacity could be harnessed for supporting the UN with desperately needed resources and expertise; on the other hand, it was feared that the development of CSDP could further estrange Europeans from engaging directly in UN peacekeeping (Koops 2011, pp. 246–250). Both hopes and concerns turned out to be true. In addition to civilian missions taking over or operating alongside the UN in Bosnia and Kosovo, the EU has launched four military operations directly in support of UN peacekeeping missions: Artemis and EUFOR RD Congo in support of MONUC in both 2003 and 2006, EUFOR Tchad/RCA in support of MINURCAT in 2008–2009, and EUFOR RCA as a bridging operation to the UN Mission in the Central African Republic in 2014.3 In all four instances, the EU demonstrated that it could provide key resources and support to UN-led peacekeeping at critical junctures. Particularly operation Artemis, which was deployed less than two weeks after the UN Security Council’s authorisation, highlighted the EU’s (and most notably France’s) willingness to support UN peacekeeping in a robust manner, although for a very short period of time and on strict EU terms (Gegout 2005). In 2006, EUFOR RD Congo once again reinforced MONUC’s presence and posture during the DRC’s first democratic elections. While posing a far more difficult logistical and political challenge, EUFOR Tchad/RCA marked a further step in EU-UN inter-organisational peacekeeping cooperation through the co-deployment during the first year and substantial re-hatting of EU troops to MINURCAT in 2009. More recently, EUFOR RCA acted as a bridging operation before the MINUSCA took over. In addition, EU civilian missions (such as EUPOL and EUSEC RD Congo) supported MONUC through small-scale security sector reform and police reform, while the EU’s largest civilian mission—EULEX Kosovo—has been working closely with UNMIK. In Mali, the two EU operations also play a role of burden-sharing with the UN operation (MINUSMA). Second, interaction in the field has led to the formalisation and institutionalisation between the two Secretariats. Two UN-EU Joint Declarations signed in 2003 and 2007 respectively have laid the basis for this institutionalisation (Council of the European Union 2003, 2007). While the 2003 Declaration was a direct follow-up to the cooperation experience in the context of the EU Operation Artemis, the 2007 Joint statement reiterated the EU’s commitment to UN peacekeeping and linked the partnership to joint capacity-building efforts vis-à-vis the African Union. Both documents advanced joint communication and coordination channels, such as desk-to-desk dialogue and regular video conferences on thematic issues and emerging security threats. The 2003 Declaration also called for a ‘UN-EU Steering Committee’ to convene twice a year in order to bring together key officials from both organisations with a view to strengthen inter-organisational relations. In 2011, the UN Department of Peacekeeping Operations (DPKO) and the Department of Political Affairs (DPA) opened a joint UN Liaison Office for Peace and Security (UNLOPS), establishing a permanent presence in Brussels and an additional layer of the UN’s institutionalised cooperation with the European Union and to a lesser extent with NATO. In the same vein, the EU issued in 2012 an “Action Plan on CSDP support to UN peacekeeping” (Council of the European Union 2012) that helped revitalise the partnership at a moment of rather low CSDP activity. The Action Plan defined a series of actions to move the relationship forward, with the hope on the UN side that the partnership would also take the form of national European contributions to UN peacekeeping operations. In 2014–2015, the deployment of EUFOR RCA as well as EUCAP Sahel Mali , in both cases in parallel with UN operations, allowed for renewed cooperation between the two institutions. In parallel, in 2015 a new framework on the “UN-EU Strategic Partnership on Peacekeeping and Crisis Management” covering the period 2015–2018 was being elaborated. The new plan identifies six priority areas: rapid response; support to the African Peace and Security Architecture; Facilitating EU member states’ contributions to UN peacekeeping; Cooperation in Rule of Law and Security Sector Reform (SSR); Cooperation in Support and Logistics; Enhanced information and analysis exchange (Council of the European Union 2015b). On the UN side, both the UN Secretary-General report “Partnering for peace: moving towards partnership peacekeeping” (UN 2015c), the High-Level Independent Panel on Peace Operations (UN 2015a), and the Secretary-General’s report in response to the High-Level Panel (UN 2015b) emphasise the necessity to strengthen the “global-regional partnerships,” in which the European Union, together with the African Union, play an important role. Yet expectations are not always met and the initial concern about CSDP developing at the expense of UN operations has partly been vindicated. The UN Secretariat regularly calls for European national contributions to UN operations, in particular through “strategic enablers” such as helicopters, intelligence assets, or medical units. The possibility for the UN to rely in a semi-automatic manner on the deployment of the EU Battle Groups as a “first response capacity” that could serve as a “bridging force” until “the UN can mobilise and deploy a follow-on UN peace operation” is also regularly put forward (UN 2015b, para. 192). So far, however, this has been to no avail. Indeed, before a come-back in Mali as of 2014–2015 (see below), the development of CSDP was also to an extent accompanied by a certain disengagement of European states from UN operations. In parallel, the evolution of crisis management and the respective roles of the UN and the EU in this field raised the issue of complementarity of these different frameworks, and even of competition between them. Overall, while the UN-EU partnership has delivered tangible results, the two institutions are also fora and instruments of international politics, which carries incentives for cooperation as much as for defection. Time for Europe to Return to UN Peacekeeping? Stricto sensu, EU-UN cooperation does not include the issue of EU member states’ contributions to UN operations. States participate in UN operations in their national capacity, and the idea that the EU as an institution could contribute to a UN-led operation has so far not happened. However, the EU-UN relationship is in many ways dependent on EU member states’ policies, their institutional preferences, and their perception of complementarity between UN and EU crisis management. As a matter of fact, while the 2012 EU-UN Action Plan, as well as the latest 2015 document, mention “national contributions” to UN peacekeeping operations as a key element of the partnership, this seems not to reflect reality. Indeed, European countries have largely moved away from UN peacekeeping as a result of the lessons drawn from their commitment to such operations in the early 1990s, mainly in Bosnia, Rwanda, and Somalia. In 2017, EU states collectively financed between 35 and 40% of the UN peacekeeping budget, and played a central role in UN operations’ mandate design, most notably through the two European permanent members of the Security Council (Tardy and Zaum 2016). But before the situation changed in 2014, when some European countries started to participate in the UN operation in Mali, European troop contributions had over the last twenty years remained minimal, oscillating between four and eight percent of the total. As of December 2013, prior to the comeback of some European states to UN peacekeeping in Mali, the 28 EU member states were contributing 4819 military personnel and police—i.e. 4.9%—out of the 98,200 uniformed personnel deployed in the 16 UN peacekeeping operations. The bulk of the European contribution was deployed in the operation in Lebanon (UNIFIL). As of May 2017, that figure had raised to 6577 out of 96,617 uniformed personnel, that is 6.8%, as a result of the contribution of Germany, the Netherlands, and Sweden to the MINUSMA in Mali (UN 2017). European states have remained by and large committed to peace operations, but have favoured frameworks—such as the EU, NATO, or coalitions of states—that better suit their political and military requirements in terms of strategic cultures, command and control structures, or interoperability among troop contributors. For most of them, the UN has lost the trust placed in it right after the end of the Cold War, and is perceived as ill-equipped for complex crisis management. The command and control structure has received the most criticism and distrust. From a military point of view, the diversity of military cultures combined with the weak authority of Force commanders over the contingents deployed could only weaken the credibility of the UN chain of command and therefore the trust placed in it by units on the ground. Since the mid-1990s, efforts have been made to try to reform the UN, with the hope that by making it more efficient, one could entice countries that formerly distanced themselves from the institution to reconsider their position and possibly return to UN operations. Lately, the argument has often been that “a lot has changed” within the UN and that the flaws of the early 1990s were now fixed, therefore allowing reticent countries to consider coming back to UN peacekeeping. The debate was particularly prominent in 2013–2014 in the context of the termination of the International Security Assistance Force (ISAF) in Afghanistan around the idea that some of the Western or European states present in ISAF might switch to UN operations once they pulled out their troops from Afghanistan (Johnson 2014, pp. 85–96; Smith 2014; Byers 2012). And indeed, a few of them approached the UN DPKO to explore further this option. It is in this context that the Netherlands, and then Sweden and Germany, announced their participation in the UN operation in Mali (MINUSMA), mainly through Intelligence, Surveillance and Reconnaissance units. In parallel, a few European countries—among them the Netherlands, Sweden, Norway, Denmark, Germany, Finland, and Estonia—have contributed personnel to an intelligence fusion cell integrated into the MINUSMA (Karlsrud and Smith 2015). As of May 2017, the Dutch, German and Swedish contributions to the MINUSMA were 273, 618, and 199 respectively (UN 2017). This shows to an extent a return of European states to UN peacekeeping, or at least openness towards the UN as a political and operational crisis management actor.5 Indeed the UN displays comparative advantages that may trigger renewed interest given the complexity of contemporary threats. Most prominently, the UN provides a unique framework for cooperation between Western and non-Western states at a time when the former may want to reach out to the latter in their security policies (Gowan 2015). UN operations may also be seen as operational responses to states’ fragility and this fragility’s possible consequences in terms of political destabilisation or youth’s radicalisation. In the case of Mali, contributing to the UN operation can be a way to participate in the broad international stabilisation efforts of the Sahel without being involved in the direct military confrontation with the armed groups operating in Northern Mali. Whether this comeback is a prelude to a more significant return to UN peacekeeping remains to be seen; at least three obstacles exist. First, mistrust vis-à-vis the UN still tends to prevail within European ministries of defence where the thinking is still influenced by the 1990 engagements in Bosnia, Rwanda, and Somalia. The idea that the UN has, through several processes of reform, become a more effective crisis management actor is up for debate. Ministries of foreign affairs might be more agnostic on the virtues of the UN in peacekeeping, but military officials by and large still see the organisation as unfit to the task of complex crisis management. The UN institutional culture and the command and control structure are recurrently invoked as obstacles to a renewed European commitment. As a matter of fact, the Report of the High-level Independent Panel on Peace Operations acknowledges that the UN still suffers from “weak command and control” and has not sufficiently invested in this field (UN 2015a, paras. 35, 115). Second, a comparative analysis of the various existing institutional channels does not portray the UN in the most favourable manner, as institutions such as NATO or the EU would in most cases be seen as more appropriate. The Mali situation—with a significant contribution from two European countries—provides an exception to this rule. The analysis in the Netherlands, Sweden, and Germany was that the UN, because of the nature of its operation in Mali, was the most appropriate recipient for the type of assets that they were willing to deploy. Such a scenario can be replicated elsewhere with other European States. Yet the incentives to opt for the UN rather than the EU, NATO, or multilateral operations are not obvious and in reality, European states are likely to prefer the more restricted clubs, both as a path dependency choice and for political reasons. The EU itself may not always come up as the best option, and recent EU operations have shown that the EU could also suffer from a certain level of disaffection. How this may incentivise European states to look at the UN in a more positive way is very uncertain. In this context, the type of lessons that the Europeans will draw from their experience in the MINUSMA will in part determine both their own long-term commitments and a possible come back for other European states. The literature that is appearing on these issues, often based on the Mali situation, seems to indicate that the European states that have contributed to the MINUSMA are more vindicated in their mistrust vis-à-vis the UN than reassured that the UN is one option amongst several. What the MINUSMA has also revealed is the emergence of a two-tier operation in which the Europeans and the non-European contingents hardly communicate with one another, and where the African and Asian contingents benefit very little from the intelligence gathered by the Europeans (Albrecht et al. 2017). This is in itself an interesting conclusion as it tends to undermine the assumption by which Europeans are needed in UN operations because of the enablers that they bring. Finally, a possible European “comeback to UN operations” is also to be analysed for what it would imply for the EU CSDP. Given the general restrictions on force projection resources, any scenario that would mean a significant European contribution to UN operations would most likely play to the detriment of the political and operational prominence of CSDP, as much as CSDP can develop at the expense of the UN. European states commit assets to UN or EU operations, but probably not to both at the same time. The last fifteen years have indeed shown that assets provided to the EU (troops, enablers, etc.) were de facto not provided to the UN. Typically, the principle of bridging operations means that EU member states decide not to participate in UN operations but rather to support them through EU operations. Paradoxically, it is possibly precisely because European states are not in the UN mission that the bridging operation becomes necessary. As highlighted by the various studies or reports on UN peace operations released in 2015, the crisis management landscape has evolved into a multi-actors endeavour that calls for an inclusive “global-regional partnership”6 (UN 2015a, p. viii; 2015b, paras. 28–32). The United Nations has a key role to play in materialising such partnerships and building coherence out of the various institutions’ priorities and activities. Similarly, the European Union is one of the main pillars of this effort, and the latest EU Global Strategy clearly reasserts the European commitment to promote a “rules-based global order” with the “United Nations at its core” (European Union 2016, p. 10). Indeed, the EU has become an autonomous crisis management actor that in most cases operates alongside the UN and potentially can support UN operations in different ways. Yet the degree of compatibility between the UN and the EU is to be evaluated in light of the two institutions’ respective agendas and constraints. The EU has embraced a conception of crisis management that is close to the UN’s and is a priori willing to support the “global-regional peace and security partnership”; also, EU operations need the UN for legitimacy and in their transition strategies, in particular when the UN takes over from the EU and practically enables the EU to withdraw. But the EU is also a highly politicised and state-dominated organisation that aspires to ensure its own visibility and independence. Besides, despite recent developments in Mali with significant European contributions to the UN operation, EU member states continue to view the UN with a certain level of suspicion and are overall reluctant to participate directly in UN operations. In this context, this chapter poses the following two questions for further research and strategic policy deliberation: (1) how long can the absence of European states from UN peacekeeping be prolonged without truly undermining the UN-EU peace and security partnership, and beyond it the North-South dialogue? and (2) do UN peace operations respond to evolving security threats in a way that makes European states want to re-investing in them? For a presentation of past and on-going EU civilian missions, see the European External Action Service (2017) at https://eeas.europa.eu/headquarters/headquarters-homepage/area/security-and-defence_en. For a presentation of past and on-going EU military operations, see the European External Action Service website (2017) at http://www.eeas.europa.eu/csdp/missions-and-operations/index_en.htm. Artemis was a French-led EU mission, deployed from June to September 2003 to provide robust support to MONUC in Ituri. See United Nations Peacekeeping Best Practice Unit (2004). On EUFOR Tchad/RCA, see Mattelaer (2008). See for example Richard Gowan (2009). See on this the Special Issue of International Peacekeeping by the editors Joachim Koops and Giulia Tercovich (2016), with chapters on Germany (Joachim Koops), the Netherlands (Niels van Willigen), and Sweden (Claes Nilsson and Kristina Zetterlund). See ibid., p. viii, and ‘The future of UN peace operations: implementation of the recommendations of the High-level Independent Panel on Peace Operations’, Report of the Secretary-General, A/70/357, 2 September 2015, paras. 28–32. Bund, Jakob, Daniel Fiott, Thierry Tardy, and Zoe Stanley-Lockman. 2017. EUISS Yearbook of European Security 2017. Paris: European Institute for Security Studies. https://www.iss.europa.eu/content/euiss-yearbook-european-security-2017. Accessed 16 Nov 2017. European External Action Service. 2017. Security and Defence. European Union. https://eeas.europa.eu/headquarters/headquarters-homepage/area/security-and-defence_en. Accessed 16 Nov 2017. European Parliament. 2012. CSDP Missions and Operations. Lessons Learned Processes. European Parliament Think Tank. http://www.europarl.europa.eu/thinktank/en/document.html?reference=EXPO-SEDE_ET(2012)457062. Accessed 16 Nov 2017. European Union. 2016. Shared Vision, Common Action: A Global Strategy for the EU’s Foreign and Security Policy, June. Brussels. https://europa.eu/globalstrategy/sites/globalstrategy/files/eugs_review_web.pdf. Accessed 16 Nov 2017. United Nations. 2017. Troop and Police Contributors. United Nations Peacekeeping. https://peacekeeping.un.org/en/troop-and-police-contributors. Accessed 5, 11 Dec 2017.